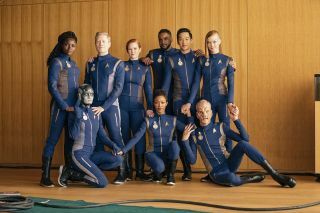 The crew of the Discovery poses after the Season 1 finale of "Star Trek: Discovery." Warning: This article includes spoilers from the first season of "Star Trek: Discovery." The new series "Star Trek: Discovery" wrapped up its first season last night (Feb. 11), bringing viewers down a twisted path that involved an alternate universe and several characters with bizarre pasts. Where can Season 2 go from here? It's hard to make firm predictions about next year's season, but here are some avenues the showrunners should explore. There is no release date for Season 2 yet, but back in September, executive producer Alex Kurtzman told The Hollywood Reporter that he expects the season to begin no earlier than early 2019. Sarek chose to recommend Spock instead of Burnham for the Vulcan Expeditionary Group, which was a huge honor — but it worked out badly for both siblings. Burnham wanted to join the group and was shattered when she was told (falsely) that she didn't qualify. And Spock just rebelled against his dad and chose to go to Starfleet instead. The season ended with the Klingon outcast L'Rell (Mary Chieffo), armed with a detonator that threatens the Klingon home world, convincing the 24 Klingon houses to unify and end their war with Starfleet. That's great for intergalactic peace, but unfortunately, those actions killed a very promising part of the plot that explored the conflict between Klingons and the Federation in Starfleet's early days. One thing "Discovery" should address is the modification program that temporarily fused together Voq (a Klingon) and Ash Tyler (a human). The operation did not go well, and Voq was eventually excised from the hybrid. But this sounds suspiciously like the genetic-modification program involving humans that permanently changed the Klingons' appearance (as explained in "Star Trek: Enterprise," 2001-2005). I hope this is cleared up in Season 2, as we spent a lot of screen time exploring Voq, Tyler and how the plotline affected Burnham's relationship with Tyler. The season started on a promising note as we looked at the tension between the Klingon houses. While L'Rell's actions appear to unify them, understanding more about the different factions would be great for fans of "Star Trek" history. Some possible avenues to explore: What were their points of difference? How did it affect relations with Starfleet? Why did the Klingons fundamentally distrust other species? One of the biggest innovations of "Discovery" was a classified spore drive that allowed a starship to jump instantly from place to place. There were so many subplots related to this: the alternate universe, the space whale in the funny time-loop episode, the aggressive tardigrade and, of course, the effect on Lt. Paul Stamets' (Anthony Rapp) health. That list alone gives us a bunch of possible jumping-off points for Season 2 plots, but here's a more fundamental question. It appears the spore drive was abandoned at some point in its testing, because future "Star Trek" crews mainly have ships that travel using warp drive. Why? What is it about the spore drive that caused Starfleet to stop working on it, when it appears so handy for place-to-place transport? We also can't forget that, theoretically, the crew could jump back to the alternate universe at any time (and that the alternate-universe Georgiou is wandering free in the "real universe" right now, with her xenophobic beliefs). We spent several episodes in that other universe, so expect some sort of mention of it in Season 2. Please, please bring back Harcourt Fenton Mudd (Rainn Wilson). He's got just the right element of hilarious, crazy-thinking unpredictability about him to really mess up a starship's agenda, just like Q in the older "Star Trek: The Next Generation" (1987-1994) and "Star Trek: Deep Space Nine" (1993-1999) series. His cackling line in the time-loop episode remains my favorite of the "Discovery" series so far: "There really are so many ways to blow up this ship — it's almost a design flaw!" I can't help but think that Starfleet should have a schism developing after some people took nearly genocidal action against the Klingons, but others disagreed. Let's explore more of that situation. Will the USS Discovery rebel, as was suggested in the season finale? What are the real intentions of Adm. Katrina Cornwell (Jayne Brook), who seems all too eager to choose war over strategy? How did this struggle play into how Starfleet developed? I'm glad there are so many homages to the original series (1966-1969) in "Discovery." Let's take another idea from that series: more one-off encounters with new species that reflect different facets of humanity. It's quite easy to do this while integrating it into the main plot; the crew's interactions with the wispy beings of Pahvo, for example, also moved along the Klingon-war subplot. I, for one, would like some more new species instead of seeing Saru's Kelpian face on the bridge week after week.